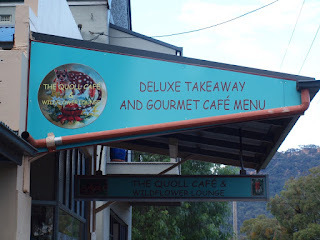 I could not think of any murals in Kandos then noticed in the local paper that there was a new mural painted by Ester Kasepuu at the Quoll Cafe and Wildflower Lounge. 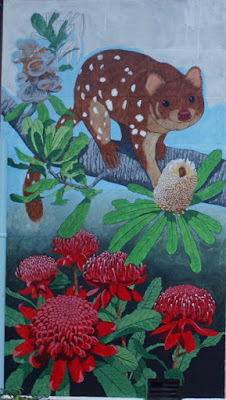 Quolls are a native animal which live locally but I have never seen one - they are nocturnal. The flowers in the mural are Banksias and Waratahs which I have seen plenty of in the Blue Mountains but not locally at Kandos. Participating in Sami's Monday Mural. ...sometime murals pop up in the most unexpected places! Yes that is the fun of them. I've only seen a Quoll in a zoo. The mural is very pretty, and love the addition of the flowers. Thanks for participating Joan. I haven't even seen a Quoll in a zoo. Animals like this are cute. Possums are cute too. It looks like an interesting animal. I have seen few that are considered nocturnal. Many of our native animals are nocturnal so we are barely aware of their existence.